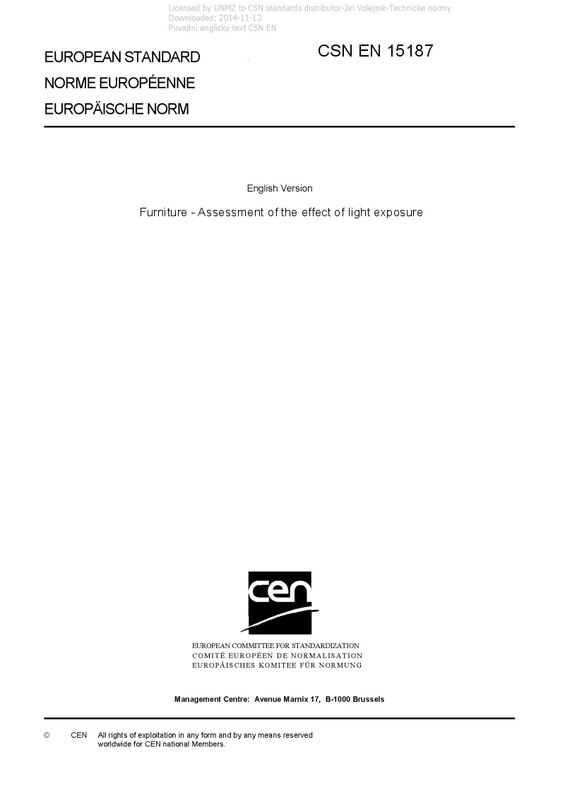 EN 15187 Furniture - Assessment of the effect of light exposure - This European standard specifies a method for the assessment of the effects of light in indoor conditions, by exposure to artificial radiation and applies to rigid surfaces of all finished products regardless of material. It does not apply to finishes on leather and fabrics. The test is intended to be carried out on a part of the finished furniture, but can be carried out on test panels of the same material, finished in an identical manner to the finished product, and of a size sufficient to meet the requirements of the test. The test should be carried out on unused surfaces. This standard describes the most important parameters, such as the colour change when a surface is exposed and specifies the conditions to be used in the exposure apparatus. The light resistance of a surface can be assessed by using two apparatus as specified in clause 4, one as a reference test method, and the other for in-company testing.